The apartment sleeps 4/5. One double room with king size bed, one twin bedded room and a sofa bed to living room. There is a communal award winning infinity swimming pool which cascades in three tiers over this spectacular mountain setting. A location in which to chill out but with the added advantage of all amenities within a short drive. Visit our Website (our website is currently undergoing changes, therefore please message us via Owners Direct with any questions you may have). The apartment is available all year round for both short and long term holiday rentals. Spring break holiday discounts, autumn holiday and winter holiday special long term deals are available. Please message us via Owners Direct with your requested dates. The apartment was purchased initially with the intention of using it purely for family holidays. However, a decision was taken to rent the apartment for both short and longer term holiday rental. 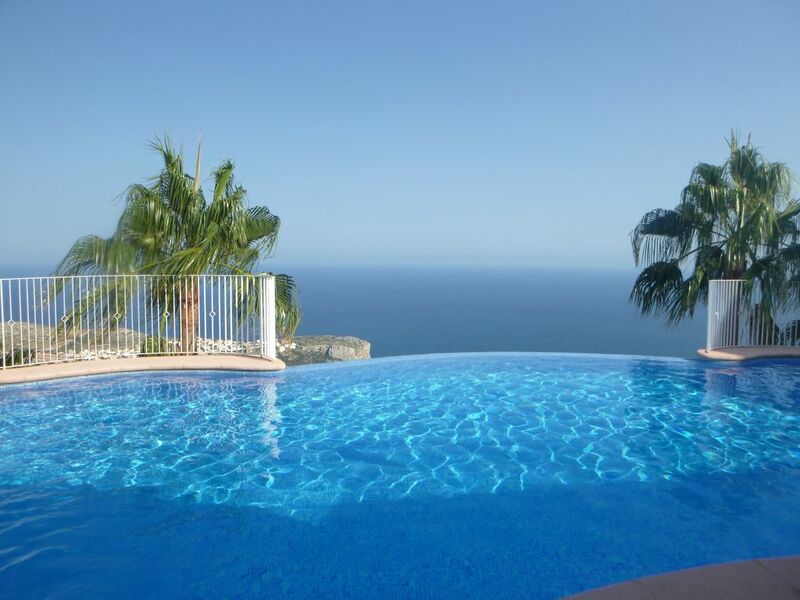 We are now able to offer to our guests accommodation which boasts some of the best coastal views in the Costa Blanca. Close to Moraira and Javea the apartment is a place to chill, explore the surrounding areas and generally have a good vacation. From that very first day of visiting the area before the apartment was built and up to the present day. I am always happy to arrive and to be able to enjoy fantastic views and the wonderful climate. Originally from St Ives in Cornwall, I love the sea and this apartment is situated not purely with astounding sea views but in a calm environment. The apartment is situated a short drive from all main amenities but provides a unique experience with the stunning views. I love staying here both during the Summer and Winter months, Even in the depth of winter the climate at Cumbre is good. Javea and Moirara are a short distance but for those guests who want to be a bit more adventurous Benidorm, Valencia and Alicante are all within driveable distance. With the apartment being accessed from either Valencia or Alicante Airport. From the award winning infinity pool to the secluded beach and excellent views this is an apartment for all seasons. Our guests enjoy both short term and long term stays at Pueblo Panorama, Cumbre del Sol. Out of season discounts are available. Please just contact me through the Owners Direct messaging service for information on discounted rates for spring holidays, autumn breaks or winter holiday let’s. We have tried to be flexible in order for guests to reach the apartment using discounted flights. We will therefore during the summer months of July and August, always try to accommodate guests who wish to arrive mid week or stay for 10, 11 or 12 days. However, in order to undertake this we do charge supplements. The air conditioning units are both cold and hot units. Additional heating is provided in the apartment for guests wishing to stay in the winder months. There is a washing machine at the apartment for our guests to use. Towels with the exception of beach towels are provided. The air conditioned dining area is situated adjacent to the open kitchen for relaxed dining. Full range of satellite channels for the use of our guests from many different countries. Unfortunately the apartment is cut into the mountain face with two sets of stairs leading downwards to the front door and therefore this makes the apartment unsuitable for wheelchair access. Award winning communal pool which cascades in three tiers over the mountain face. The apartment provides some of the best coastal views in the Costa Blanca. An area to chill but with all amenities a short drive away. The mountain setting is fantastic and facilities on the mountain include a restaurant, bar and supermarket. This is a fantastic base in which to explore the surrounding area with Javea, Moirara, Denia and Benidorm all within easy travelling distance. From catching the ferry from Denia over to Ibiza for the day to going on the short trip boat visiting Calpe and Javea. Visiting the old town of Benidorm or the various fishing villages and towns. There is always something to do and see. Well equipped apartment, views are amazing. A car is essential as even the closest supermarket is a to far and hilly to walk to. Satnav made getting round easier as it is a bit of a maze. If you want a quiet holiday with beautiful views this is the one. Fantastic sea views, great location just stunning !! Fantastic apartment, great location and fabulous sea views.Great base for exploring the area. Clean, comfortable and well appointed apartment. Great information , easy booking process and superb welcome from Lizzie. Definitely recommend an would stay again. It was an absolute pleasure welcoming you to stay and thank you for your positive feedback Jayne. I will make sure Lizzie is aware. Lizzie and I believe we have had some really fantastic guests to stay, booking through HomeAway, and coming from all over the world. I hope you will return to us one day soon Jayne. Take care and thank you for booking with us. A lovingly furnished clean apartment that I would definitely recommend. Great views from the terrace which has its only table and chairs as well as loungers. The infinity pools have a serence peaceful feel to them and a great location to get away from working life and chill out. The apartment was spacious, very clean, equipped with everything you would need and the beds were very comfortable. Spacious patio with 4 sun loungers and a nice big patio table and chairs. The views are stunning. It has 2 beautiful pools, 2 min walk away, which over looked the sea. You do need a car to travel any where, as the apartment is at the top of the mountain, hence the beautiful views. There are 3 beautiful beaches nearby, Javea, Denia and Moraira,. The sea is lovely, clear and warm. There are plenty of nice places to eat, very reasonable. The ideal place to go to relax and wind down. Very easy to find, well equipped apartment, in a good location equidistant to Moraira and Javea. The apartment is spotlessly clean and communication with both the owner and contact in Spain is excellent. Stunning views over looking the coast and out to sea from the terrace. We thoroughly enjoyed our stay and would highly recommend. I am so glad to know Sarah that your stay with us was a really good experience and that you enjoyed your time at the apartment. It would be really lovely to welcome you back again one day soon. Relaxing time with great facilities and amazing views! A fantastic apartment with great facilities and very comfortable setting. Everything was clean and modern and we couldn't have asked for more. The views from the balcony are simply breathtaking. The pool was equally awe-inspiring if not a little cool!!! The only downside to the place is that it's a little remote- and the nearest shop is a short drive away which just means that you need to be a little more organised for the day ahead. There are 2 towns close- 10 mins drive either direction with lots of bars, restaurants and lovely beaches. If it's peace and quiet and relaxation you want then this is where to come. I couldn't recommend it highly enough! It is always such a pleasure for us to know that our guests enjoy their stay. I hope that we can welcome you back again soon. Cumbre del Sol is situated between the coastal resorts of Javea and Moraira in the municipality of Benitachell. The apartment has fantastic sea views and on a clear day it is possible to see Ibiza. The Pepe La Sal Supermarket at Cumbre del Sol situated next door to the Cumbre del Sol Restaurant stocks a superb range of foods from the bakery to the extensive range of wines and spirits and international food from fine meats to every day groceries. With free parking for one car, air-conditioning, internet acess and cleaning prior to arrival and following departure. Plus no hidden charges. Our apartment provides exceptional value for money.